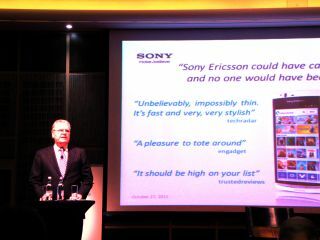 "It's a connected world that we've finally connected"
At Sony's press conference about its acquisition of Ericsson's portion of the smartphone alliance, CEO Sir Howard Stringer told TechRadar that the deal will see tablets getting a timely boost. Stringer pointed out that Sony hasn't really marketed the Tablet S or Tablet P yet, something he said would now change as the company has finally added its music and video services to the range. "We're very happy with the way tablet has been reviewed, but we haven't really launched a big marketing campaign with it yet," he told TechRadar. "We wanted to include Music Unlimited and Video Unlimited, so we've launched it rather surreptitiously, but now we need to get a big marketing campaign behind it because it has been very well received." Sony has only recently announced the arrival of Music Unlimited and Video Unlimited on its tablet range, but the smartphone arrival within the Sony brand looks likely to change that strategy again. "[Acquiring the smartphone division] will help as if our devices are all connected, then there are many opportunities to seed each other's product and to transfer that to another device whenever you move - if you don't want to watch it on your smartphone, watch it on a tablet; if you don't want to watch it on a tablet, fling it to a TV," Stringer said to TechRadar. "It's a connected world that we've finally connected, and I think in the last year people have finally stopped asking me 'Why do you own content?'. "It's taken me five years to get through a press conference without people asking that question, and now we can use our content as a weapon to drive sales of these products and also cheer up the consumer."